Wal-Mart has unsentimental business reasons for promoting sustainable fishing practices. NEW YORK (Fortune) -- Next time I dig into a slab of grilled salmon, or lay a slice of smoked salmon on a bagel, I'm going to remember Mitch Keplinger. Mitch is a fishing boat captain who plies his trade in the cold waters off Kodiak Island, Alaska. I met Mitch in June, while reporting a story on Wal-Mart (Charts) and its push to adopt business practices that are good for the environment. Wal-Mart suppliers - such as this fisherman in Alaska - are hoping the retailer can take "sustainable" food mainstream. Wal-Mart wants to drive those practices down into its supply chain, deep enough to touch people like Mitch. We'll explain how in a moment. A burly, opinionated man with a graying beard, Mitch, who is 45, is known as one of the shrewdest fishing boat captains in what has become a tough -- and tightly regulated -- business. In Alaska, the state department of fish and game tells fishermen when and where they can fish. It limits the size of their boats and the length and depth of their nets. The goal is to protect the fishery for future generations, and it's working; last year's catch of 3 million pounds of sockeye salmon was a record. As a result, Mitch is a rare species - the owner of a small business who welcomes the heavy hand of government. "The fish come first," he's says. "They've got to come first. We're secondary." One reason Mitch takes this long-term view is that his father and grandfather were fishermen, and he has a daughter who likes to hang around his boat. During the day I spent on board, Mitch and his crew of three worked hard for about 12 hours to haul in about 1,000 pounds of sockeye, which they sold to Ocean Beauty, a Seattle-based processor and supplier to Wal-Mart, for 70 cents a pound. They caught another 500 pounds of pink salmon, which sells for 35 cents a pound. That's $1,050, before expenses, to be shared by the four of them - barely worth the effort. Later in the season, they'll do better, but the low wholesale price of salmon makes it hard to earn a living running a fishing boat off Kodiak. Many veterans have given up. This is where Wal-Mart comes in. The giant retailer wants to support fishermen like Mitch, who play by the rules. And it wants to do so for an unsentimental business reason - Wal-Mart intends to grow, and to sell fish for a long time, and it needs a reliable supply. "Supply is already getting tighter," Peter Redmond, the company's vice president for deli and seafood, told me. "We have a hard time now sourcing some fish, like whiting." Redmond has spent lots of time talking to suppliers and environmentalists about how Wal-Mart help protect the future of ocean fish, and he has come up with a plan. 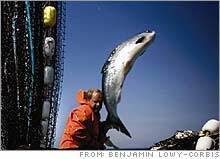 The problem, in essence, is that the market does not reward regulated fisheries, like those in Alaska, for being good stewards of the ocean. Instead, salmon is typically sold as a commodity; prices have fallen because of the competition from unregulated fisheries and especially from cheap, abundant farmed salmon, largely from Chile and Canada. This makes Mitch a little crazy. "Farm fish look beautiful, but they don't taste like fish," he complains. "They taste like nothing." Environmentalists have their own problems with farmed fish - they are incubators for parasites, they require lots of feed in the form of fish oil and fish meal, which depletes the oceans, and their waste and uneaten feed pollute coastal waters. "Salmon farms, most of them, muck up the waters pretty badly," says Becky Goldburg, a senior scientist at Environmental Defense. The MSC was formed by the World Wildlife Federation and Unilever (Charts), the British food company, after they watched the unregulated North Atlantic cod fishery, once the world's richest, collapse in the early 1990s. Meanwhile, Wal-Mart will address the ecological problems caused by farmed seafood by developing guidelines with environmentalists and industry experts. Both of its initiatives go well beyond salmon, affecting wild-caught cod, pollock and whiting, as well as farmed shrimp, the biggest seller at Wal-Mart, which, you won't be surprised to learn, is the biggest seller of fish in the United States. Eventually, Wal-Mart intends to encourage shoppers to seek out new "brands" like MSC-certified, in much the same way that some look for the "organic" label. Consumers may have to pay a little more for the "good" fish. "We're trying to reward and encourage better fishery management," explains Rupert Howes, chief executive of the MSC. "As the demand for sustainable seafood increases, if there is a limited supply base, the price will go up." If all this sounds complicated, that's because it is. (And trust me, I've left a lot of the complexity out.) What's important is that Wal-Mart's ambition is nothing less than to change the way the world's seafood is caught, farmed, marketed, labeled and sold. Nothing less will do, if the goal is to preserve the ocean's fish stocks. Experts say about 25 percent of the world's fisheries are already depleted, another 50 percent are being fished at capacity, and 25 percent have an ample supply of fish. Wal-Mart's not breaking new ground here. Whole Foods Markets (Charts) already promotes the MSC label. And Unilever helped form the organization. But Wal-Mart's scale makes it a lot more likely that things will get better for people like Mitch Keplinger.